On the 20th December 2013 in the afternoon hundreds of keen divers and boats was witness to the making of the new artificial reef named NEMESIS III. This new wreck of the nemesis was an abandon deep sea trawler with its 26 meters length and its 6 meters width. You can see from the footage of the wreck sinking it was a great experience to see such a vessel sink. Purposely sunk in area specially created for an artificial reef. The best experience you can have is being one of the first ever people to dive the Nemesis Wreck. As I descended in the water after she was sunk in the confusion of bubbles and gulps of air she released as she gave way to the sea. I could see in the clearing the nemesis wreck. What a proud wreck she was to see. Nemesis wreck had fallen backwards to the seabed with her bow last under the water. How she had landed on the sea floor at 26 meters was amazing. I cam around to the front of her to collect my cameras that I had attached to the nemesis before she was laid to rest. On my approach I could see the nemesis wreck had landed in a perfectly upright position. You could not have placed her in a better place. Its massive bow was my first glimpse as I headed up towards the front deck, with a very large mast and looking in such pristine condition. Hatches, doors and the engine room had all been cleaned and had been removed. Ready and purposely for you. The reflection of sun was beginning to shine bright off here white surface. This was going to be an amazing wreck in Protaras and was the second of the Wrecks to be sunk in the Protaras area. With the years gone by marine life can be seen on the nemesis wreck. Tuna’s, a big shoal of Amber Jacks living around the wreck. Sea bream and damsel fish, rainbow wrasse, groupers, lion fish and much more makes the Nemesis wreck such a great dive. Whether you are a wreck diver junkie or wishing to see such a pristine wreck nemesis, she will impress you. 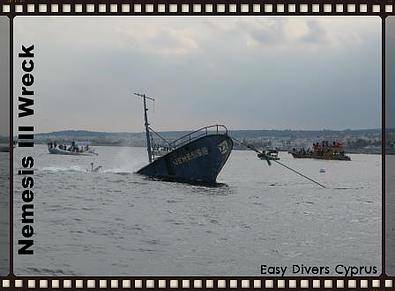 Its great for Open water level divers too with great access and open space through the bridge area on the wreck. Wreck is available for recreational divers.